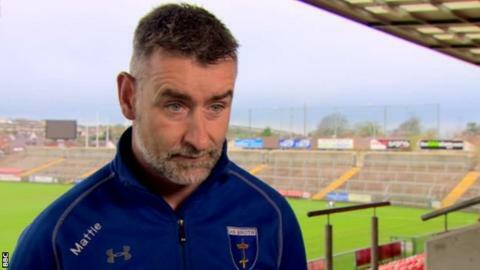 Scotstown manager Mattie McGleenan is unconcerned about playing Sunday's Ulster club SFC final on Crossmaglen's home county ground in Armagh. The Monaghan champions, bidding to win the provincial title for the first time since 1989, must travel to the Athletic Grounds to face favourites Crossmaglen. Although finals are usually staged at neutral venues, McGleenan has no issue with the Ulster Council's decision. "We're in an Ulster club final... I'd have played it anywhere," he said. McGleenan led Scotstown to a first county title in 20 years in 2013, before losing to eventual Ulster champions Ballinderry in the Ulster championship. They lost last year's county final by a point to a Conor McManus-inspired Clontibret team, but bounced back this year with another county title. "If you'd said to me 12 months ago after losing the county final that we'd be standing in an Ulster final, I'd have played it anywhere, so we're delighted," said McGleenan. "The Athletic Grounds is a unique environment, the crowd will be very close to the game and there'll be a great crowd here on Sunday. "Scotstown's coming to play and I think the whole of Scotstown will be there to support us." Scotstown defeated last year's Ulster champions Slaughtneil and Tyrone champions Trillick on route to the final, with Monaghan footballers Kieran and Darren Hughes their stand-out performers. They are rank underdogs against the six-time All-Ireland winners, who are chasing an 11th Ulster title in 20 years. "Crossmaglen are an outstanding football team who play outstanding football. "I have admired them down through the years, but if we take our chances, we'll be in the game. "There is no pressure on any of us, so let's throw the dice and see where it takes us. "Everybody expects Crossmaglen to win but if we give the performance of our lives, I think we'll ask a few questions of them." Crossmaglen and Armagh forward Jamie Clarke will be involved after returning home from America prior to the club's Ulster semi-final win over Kilcoo. He came on in the closing minutes for his first appearance in three months and should be a more influential figure in Sunday's decider. However McGleenan is aware that with quality and experience all over the field, Crossmaglen will not be relying on Clarke or any individual. "Jamie is an outstanding footballer, but he is not Crossmaglen. "They have a serious group of players. They haven't won what they have won by chance. They are a team, and teams wins championships. "If he [Clarke] is on the field we will have to deal with him, but there will be a lot of players we have to take care of before Jamie comes on."